Med3web is a web-based viewer for DICOM and other formats. It creates a 3D model of a body part based on a set of plane images (DICOM, NIfTI, HDR, KTX, etc. file formats) and shows 2D/3D views via a web browser without any installations. Med3web will please you with speed and convenience in comparison even with desktop analogues. Fast smooth 3D visualization is based on unique rendering algorithms developed at EPAM. These algorithms do not require data preprocessing, thus visualization starts right after data loading. Med3web can edit volumetric data in order to select areas of interest. This functionality is implemented with automatic and semi-automatic segmentation methods. The viewer is a free and open-source software. Try Med3web demo online — epa.ms/mri. We did not find a similar web-tool. We have developed a unique optimization of isosurface rendering algorithm. DICOM, NIfTI, KTX, and HDR formats support. Five view modes, 3D and 2D visualization. Real-time adjustment of isosurface and transfer function levels in 3D views. Measurement of distances, angles, and areas in 2D views. Viewing sample in any standard projection. Real-time volume clipping to open areas of interest. Semi-automatic methods for areas of interest opening/selection. Simple user interface without rarely-used functions. Combined surface and volume visualization mode. Support for diverse data sources: a local computer, CD/DVD, a server, or a cloud. No installation on a user computer required. Compatibility with all popular desktop OSs. The functionality depends on the selected visualization mode (2D or 3D), and in case of 3D mode on the selected visualization method. The screenshot below shows a 3D visualization mode with a volume render method. In this case, the interface provides the ability to select areas of interest inside the volume, brightness and contrast adjustment, as well as the ability to use the near clipping plane position. This method suits for bones, skin surface and segmented areas visualization. The base of this method is a search of intersection points between the rays corresponding to pixels and the isosurface. The user selects the level of the isosurface and the clipping plane position with sliders. This method suits for studying the initial data volume and the soft tissues visualization. It allows to choose an area of the interest by specifying the transfer function, which assigns the amount of the initial data to the amount of the transparency and color. To simplify the transfer function, the user uses a function in the application. The user can define this function by adjusting three parameters (a, b, and c) with sliders. The function is nonzero only if the intensity i satisfies the conditions a < i < b or i > c. When the function satisfies the first condition, the user can determine the transparency value by the value of the additional slider, and when it satisfies the second one, the transparency value is considered equal to 1. Such a subset of transfer functions is sufficient to visualize the overwhelming array of medical data. The base of this method is the calculation of the volume integral along the rays passing through the pixels. The method suits for the primary analysis of the initial data, as it does not require setting values of any parameters. This method is based on computation of the maximum values for intensities of the original data along the rays passing through the pixels. User can select ROI (Region of Interest) during segmented data visualization. Use this mode to view raw data sections in different projections and to measure the linear and angular dimensions of fragments of this data. DICOM Tags contain information about the source data such as patient data, date of data production, distance between images, and so on. 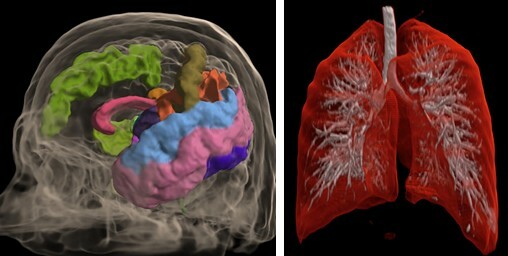 Special automatic segmentation methods are implemented for the lungs data and skull tissues separation from brain. Med3web has two methods for opening/selection areas of interest. The first one allows to clear volumetric data, which obstructs area of interest. The second method allows to cut the area of interest from the source volume using deformable 3D triangle mesh. You can try the Med3web demo online. Please note that not all browsers and video cards are supported yet. The product is under development. More features are planned for future releases: automated segmentation, volume cut, automated ROI detection, complex colored transfer functions, etc. Med3web is under active development and its source code is available at GitHub. Copyright 2016-2019 EPAM Systems, Inc.